The topic for Week 41 in Amy Coffin’s and Geneablogger’s 52 Weeks of Personal Genealogy and History series is: Teachers. Did you have a favourite teacher when you were growing up? What class(es) did this person teach and why did he/she make an impact on your life? Good teachers really do have a pivotal and formative role in our lives. I’ve been lucky to have three teachers who I feel formed my education and in the longer term, my life. The first teacher I remember as “top of the pops” was Sister Gemma who taught me in my final year of primary school. She was quite young, as opposed to many of the others I’d had previously, and she was certainly switched on and positive. Her teaching meant a great deal when you consider that in those days we sat a state-wide exam called Scholarship[i]. Depending on how one performed in that exam it was possible to gain a government scholarship for the first two years of high school, an important consideration for a working class family. Thanks to her teaching I gained the scholarship and went into my high school with a sound academic result. 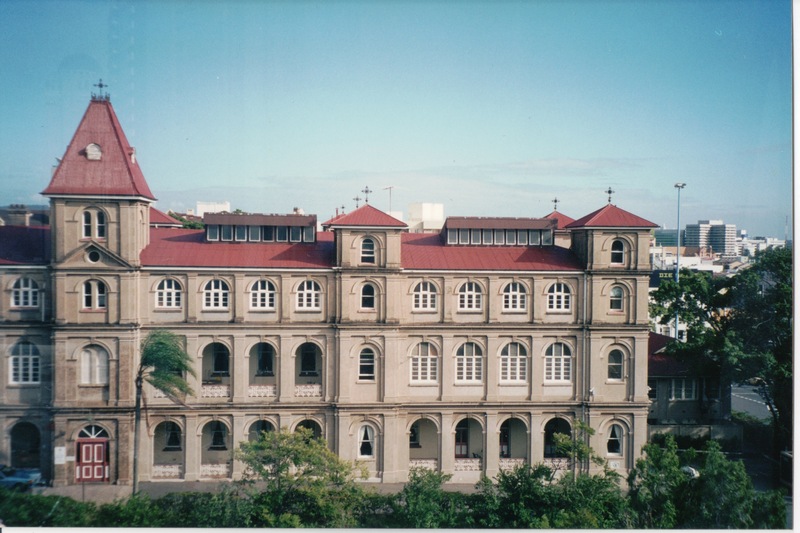 The heritage buildings of my high school in Brisbane. However it’s the teachers in my final two years, known as Senior in those days, who were even more pivotal. My class room teacher, SIster Mary Benedict, taught us all our science and maths subjects as well as religion, encouraging us to think for ourselves, challenge ideas and stretch ourselves. She was a ball of energy and intelligence, a wonderful teacher and offered great encouragement, knowing when to issue a challenge to one’s intelligence or academic performance. My other senior teacher, Sr Mary Borgia, was my German teacher who had something of a problem getting the science class to take this non-science subject all that seriously. We used to think her pronunciations rather over the top but I remember on my first foray into German-speaking countries in Europe realising her accent and pronunciation had been entirely correct. Her teaching has made it so much easier to follow up my German heritage so I’m very grateful to her for this knowledge, however rusty it now is. On one visit back to the school she told my mother (rather charitably) what a lovely girl I had been –she’d plainly forgotten the day she’d sent me out of class for doing Maths II problems in German class! There are often criticisms of nuns as teachers but in my thirteen years at school I had only one or two occasional teachers who were not nuns. Not only were the nuns our teachers, but these complex and sophisticated businesses called schools were also run by nuns who had the foresight to move with the times and provide cutting edge facilities for their pupils: we had language laboratories and science labs that were truly advanced. Many of the nuns were truly superb teachers, influencing the academic success of their pupils not only at the time but also into the future. The good ones taught us to think, to question, and to understand, not to rote-learn. They also provided role models of intelligent, capable, working women long before feminism came to the fore despite perhaps not quite intending this outcome. For me the excellent teachers outweighed any poorer teachers and I owe them a great debt of gratitude. So many of my positive life memories come from my high school years. [i] This refers to standard at Year 5, but the exam was taken at the end of year 8 when I completed it.